This Voltage Isolator is designed to allow your model to use higher voltages only on certain servos. Using higher voltage on the servos will increase the power and reaction time. However, there are other electronics that should not be powered by 6 volts. The Voltage Isolator provides a barrier between the 5v electronics and the 6v electronics. The Voltage Isolator works by using a CMOS buffer to increase the voltage level of the signal up to 6.0 volts. To eliminate glitching, all of the grounds wires are connected together. 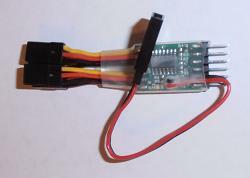 The power wires on the servo plugs are all connected together, and the power pins on the 6v side are all connected together. The Voltage Isolator circuitry receives its power from the receiver. The output of the Voltage Isolator needs to be powered by a 6v BEC (Battery Elimination Circuit) or battery. A Futaba female plug is included to plug the 6v BEC or battery into. The channels on the Voltage Isolator are labeled A through D because it does not matter what channels or the number of channels it is used on. Typically, only 3 channels will be used on most helicopters (pitch, and 2 swash plate channels). On airplanes, the number of channels that are used will vary depending on the number of servos and functions in the airplane. If the Voltage Isolator is used on an aircraft without an ESC that can supply 5 volts to the receiver, a 5v BEC must be used instead of an ESC to power the receiver and other 5v electronics.